In last night's Jays game, the Blue Jays made the decision to intentionally walk Dustin Ackley in the ninth inning. Here's how it happened: the Mariners, who were only down by one run, had a runner on first when Ackley came to the plate. With the count 3-1, (as I recall, but I can't actually verify it) J.P. Arencibia's pick-off throw flew 10 feet over Adam Lind's head and the runner, Kawasaki, advanced to third. And so the Jays elected to walk Ackley and go after the next batter, who was a pinch-hitter, John Jaso. But was it a good idea? A bad idea? My first reaction was "ridiculous", but let's look at the numbers. For his career, Ackley has a .282/.355/.419 triple-slash against right-handed pitchers, about 15% above-average. And with a 3-1 count he becomes a much better hitter - his expected on-base goes up about .200 points, and he goes from being a hitter who's 115% of average to 115% above average. Jaso is a somewhat weaker hitter than Ackley according to the rest-of-season ZiPS projections, only slightly above-average against right-handed pitching. (They're both left-handed bats, so the platoon-advantage exists in both cases.) But the pinch-hit penalty exacerbates the difference and turns this him into a hitter who's only a bit better than replacement-level - something like 15% below-average. Also, they both become slightly better hitters because of the presence of a runner-in-scoring-position. But you know what? If you pitch to Ackley at 3-1, he has about a 55% chance of reaching base. That's really high, sure - only a 45% chance that you'll get him out and end the game right then and there. But if you walk him, intentionally? That's a 100% chance of reaching base, and no chance of ending the game. So, what are the odds, irrespective of hitter ability? With the walk to Ackley, Toronto's win-expectancy dropped from 87% to 83.1%. That seems tiny, in a vacuum, but it's significant. I should add that Ackley's speed means that he stands a good chance of stealing second, which improves the run-expectancy (and, thus, win-expectancy) by a pretty large margin - to 0.626 - and the chances that a single scores the go-ahead run improves immensely, increasing the value of that single by exactly half a run, to 1.46. In the category of Harder to Quantify, we should also consider that the need to hold Ackley opens up a big hole on the pull-side of the infield for Jaso. I'm not sure whether a study exists that covers just how much that helps, but it does. In short, the Mariners' chances are improved significantly with the additional baserunner. What's trickier - far too tricky for me to number-crunch with a great deal of confidence - would be coming up with context-specific numbers. 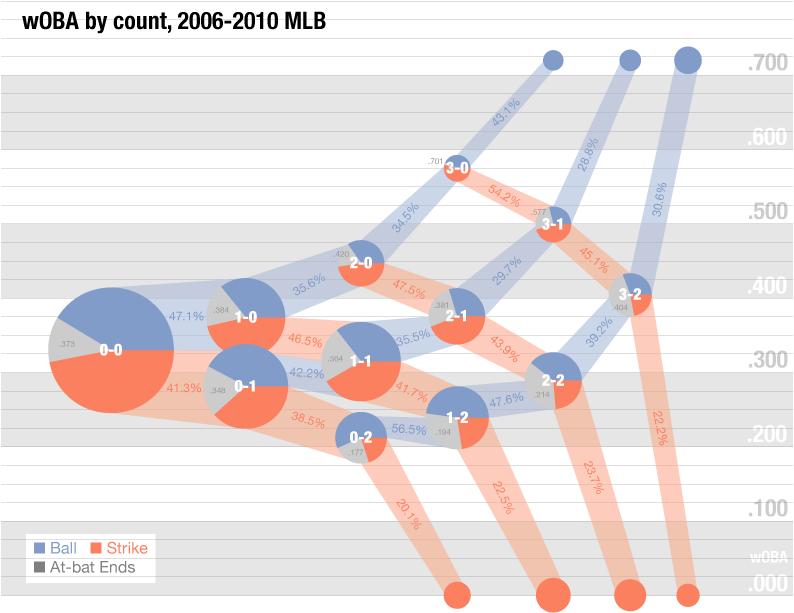 That is, combining the base-state numbers and the Ackley/Jaso numbers. If I do something quick and sloppy, like multiply run-expectancy by wRC+, then the numbers are virtually identical. But the opportunity for Ackley to steal and that hole in the infield are enough to make me think that the intentional walk wasn't worth it.